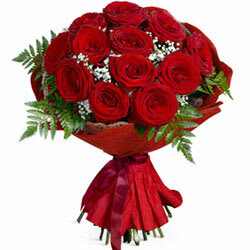 Love is best expressed by sending this gift of Blooming Seasons Greetings Rose Bouquet to your near and dear ones. This appetizing Bouquet is decorated with 12 Fresh Roses and Greens tied in a Tissue. Create magical moments by ordering online this Memorable Moments Roses Bouquet for your loved ones and spread your warm feelings into their hearts. This Bouquet of 15 Fresh Roses is decorated with Fillers and tied in an elegant Tissue. Create magical moments by ordering online this Memorable Moments Roses Bouquet for your loved ones and spread your warm feelings into their hearts. This Bouquet of 18 Fresh Roses is decorated with Fillers and tied in an elegant Tissue. Create magical moments by ordering online this Memorable Moments Roses Bouquet for your loved ones and spread your warm feelings into their hearts. This Bouquet of 24 Fresh Roses is decorated with Fillers and tied in an elegant Tissue.